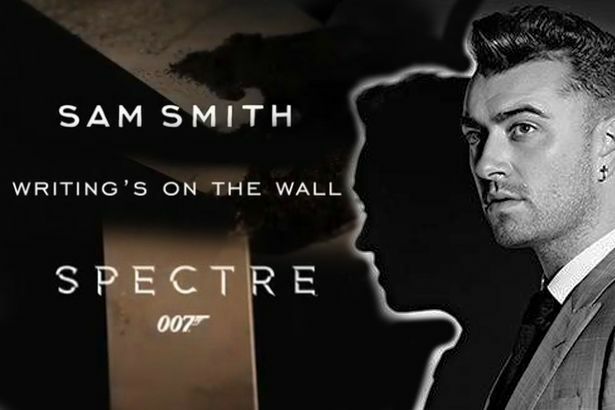 The latest James Bond theme song has been released today (25 Sept) sung by Sam Smith and called “Writing’s on the Wall”. The song has been written for the 24th instalment of the franchised film genre which tells the story of Bond’s first encounter with the global criminal agency known as SPECTRE. It was once again directed by Sam Mendes. 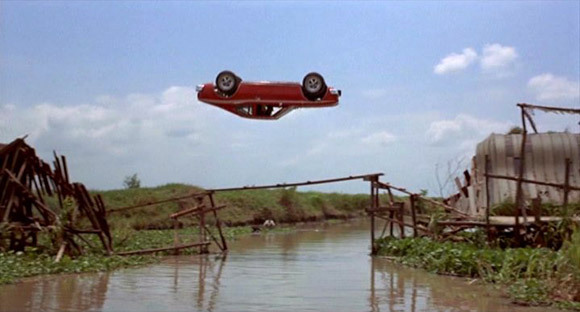 I often think that writing a song for Bond must be a little bit like writing for Eurovision – everyone has an opinion and it is never as good as when ‘Bucks Fizz’ did it; which can be seen by the fact that Dame Shirley Bassey’s Goldfinger song started trending. Smith’s Writing’s on the Wall feels rather timid and underplayed compared to previous Bond themes. It starts off well with the crashing string harmonies and atmospheric ‘the lady like’s Milk-Tray’ horn section. However, it then goes into what feels like any other pop song – that only hints at being for the famous franchise. In fact, it starts very much like Adele’s Skyfall – but where Adele’s song develops into a fully formed- “this is a Bond song, get over it” – I’m not sure Sam’s does. It doesn’t feel memorable. When my mind replays Adele, I can clearly hear her vocals pitching up and down – like a boat in a gale force 8 storm – her voice crescendoing up and over as she reaches the crest of “skyfaaaAAALLLLL” with the stings & horns crashing around her – giving it that memorable sound. “Writing’s on the Wall” is ok for a song – but maybe not for a great Bond song and is only memorable in that it has Sam’s voice stamped all over it. 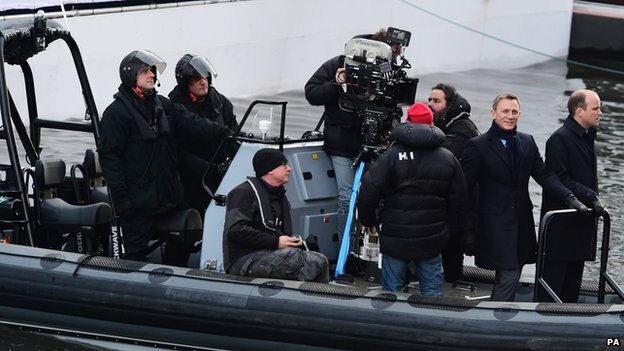 On location: filming on the Thames in London for the 24th 007. Then again – maybe it’s a generational thing. I loved Casino Royale and thought it heralded a new era in bond; and then found no solace in 2008’s Quantum; and was left suitably unimpressed by large chunks of Skyfall. So maybe, the whole modern Bond thing just isn’t for me. I loved my Bond when he made a witty off-the-cuff remark after jumping 500 feet from a cable car or when the villain cartwheeled over rivers and escaped in a flying car. 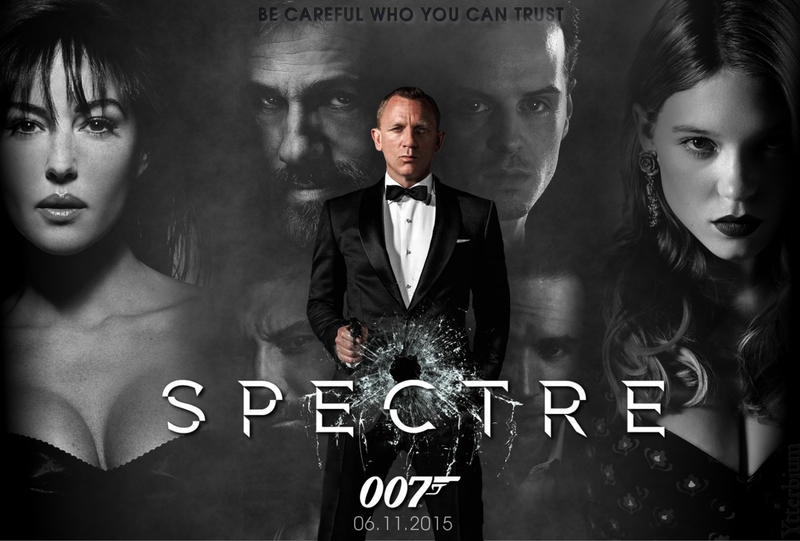 Spectre is scheduled to be released on 26 October 2015 in the United Kingdom on the same night as the world premiere in London, followed by the worldwide release on 6 November.